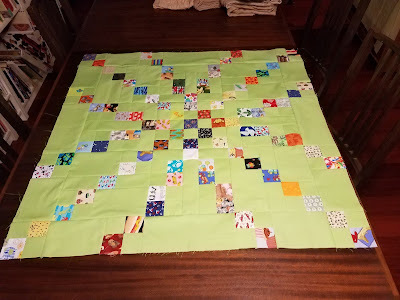 My April goal for OMG, the monthly goal-setting party hosted by Patty at Elm Street Quilts, was to finish the remaining 55 blocks needed for my Scrap Dance Tango. 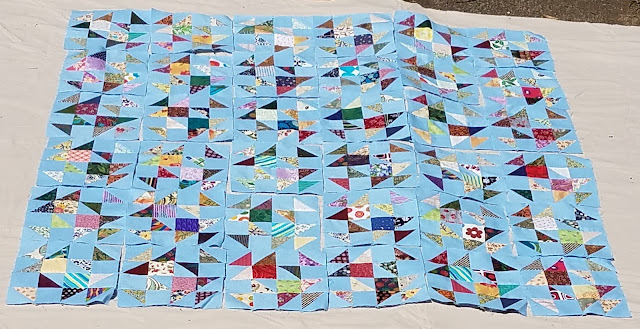 And I'm thrilled to say that I finished all the needed blocks! I even went back through them all (these 55 as well as the first 55) and found 3 that were put together incorrectly and fixed the errors. I just hope I caught them all! 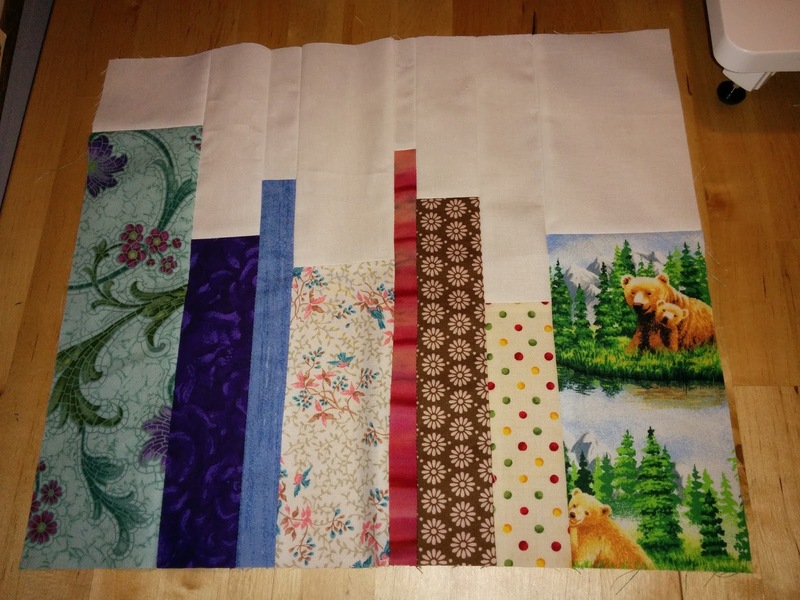 In addition to finishing all the blocks, I have assembled 6 of the needed 11 rows to complete the top. 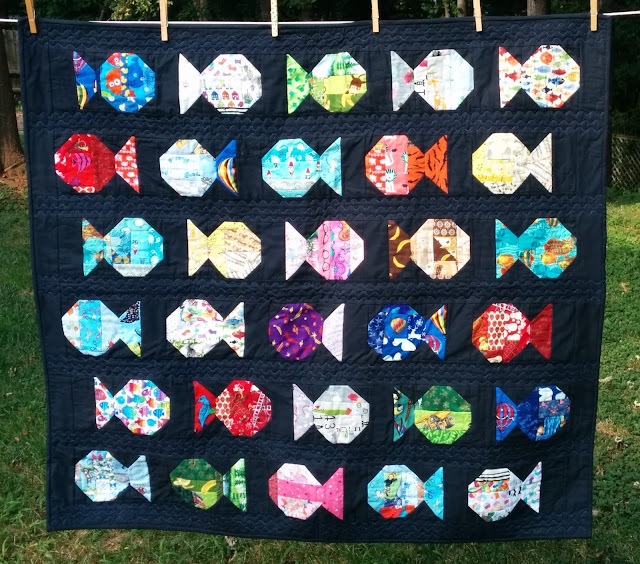 This was a mystery quilt create and hosted by Carole of From My Carolina Home. 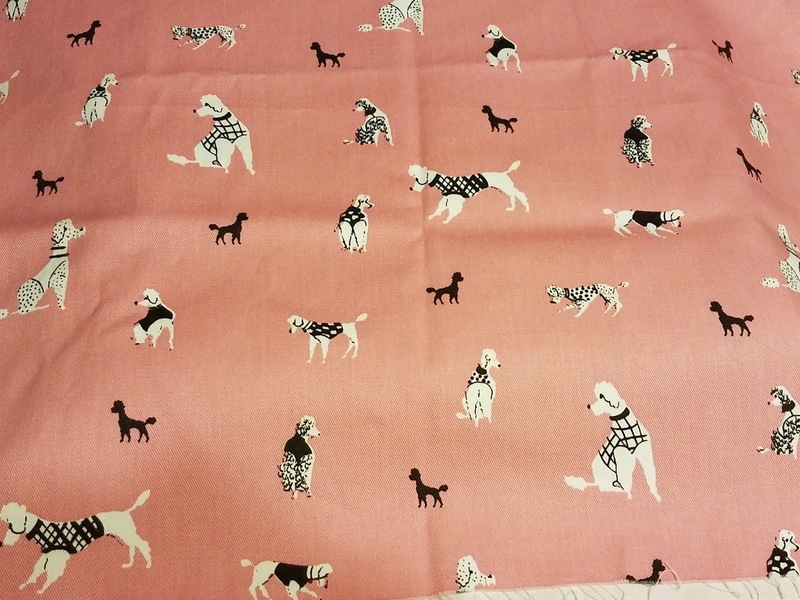 I'm still not sure how I feel about the pattern, but at this point, I am committed! I want to get this one finished! 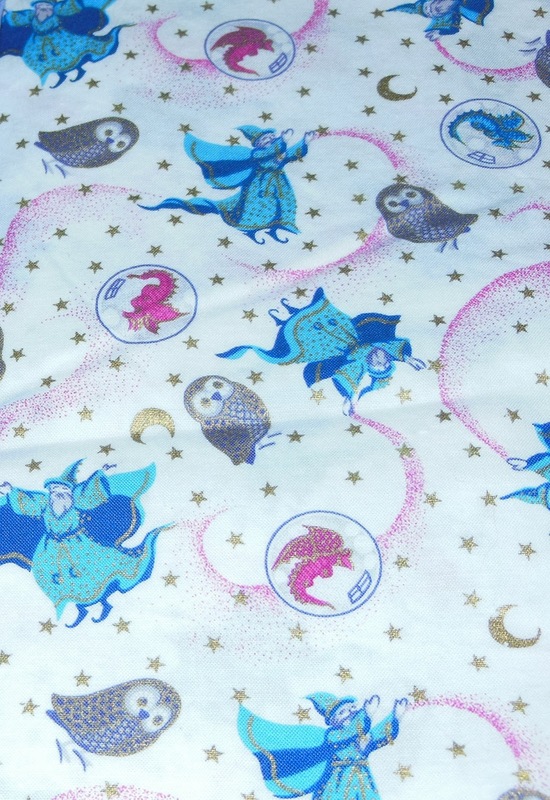 At some point several years ago, my mom sent me some novelty fabric because she knows I love it, and one of the pieces was this wizard print. If you look, you'll see wizards, stars, owls, dragons, and crescent moons. At a quilt show in 2015, I bought 2 batiks with stars in them to go with this. I finally sewed it up into a top. It's simple, but it made the most of the fabric I had. 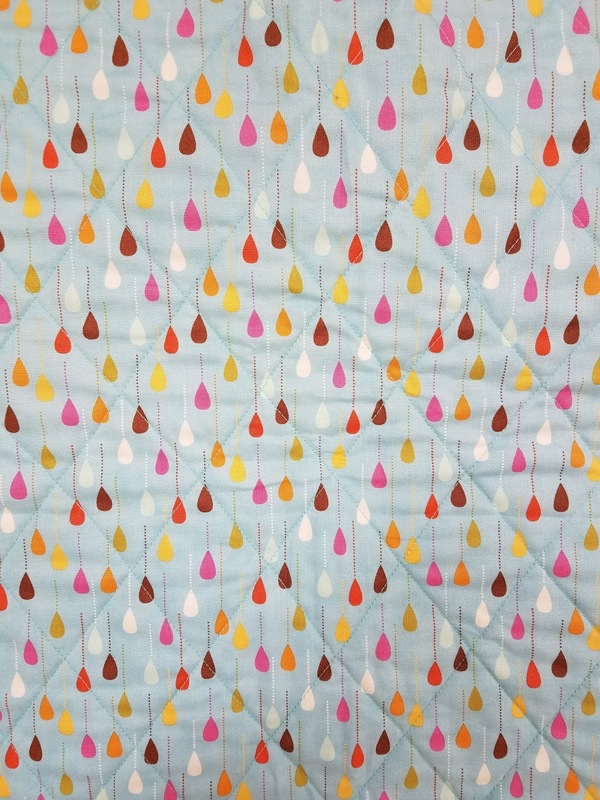 We've had lots of rainy weather lately, so no good shot of it hanging on the line. 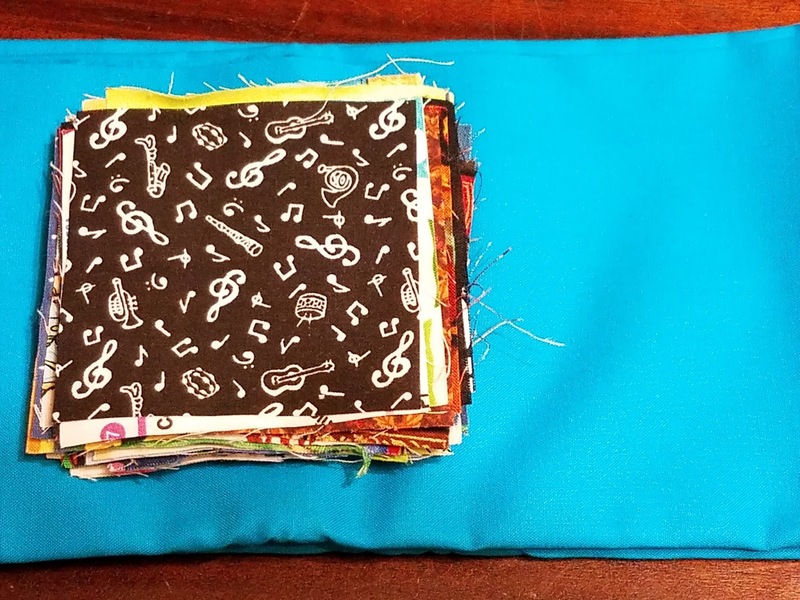 You can't tell from the picture, but it's a scrappy binding. 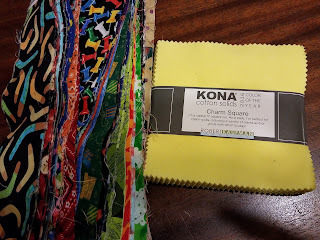 I had one strip each left of the two batiks, and I mixed in some purple strips left from the jelly roll used to make my Quilt for Pulse last summer. For quilting, I used the star stitch on my machine, and I did both sides of the wizard stripes and the lighter colored stripes. I used a variegated thread with pinks and purples in it. I really like how the stitching looks. This was project #12 on my list of Q2 goals for the globally hosted finish along. 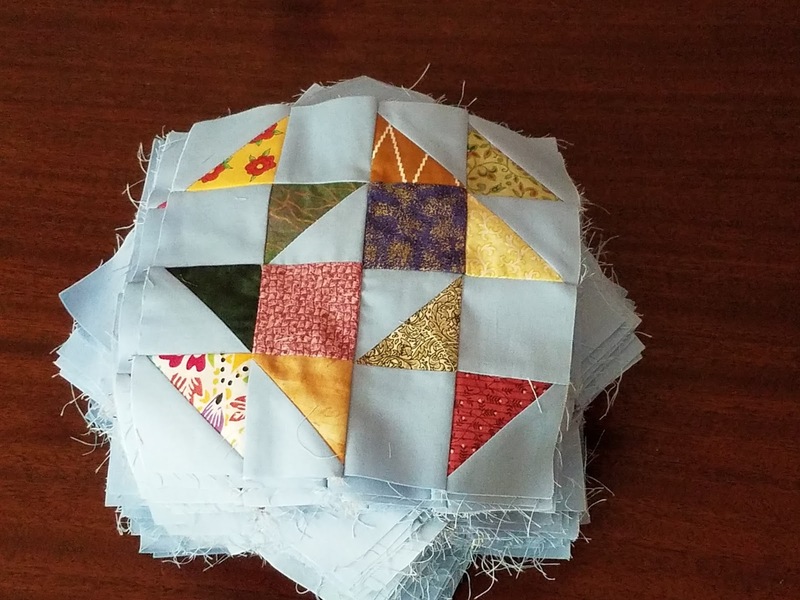 Last week was my turn for the New Quilt Blogger's Blog Hop. I had a lot of fun reading everyone's comments and visiting all the other blogs who took their turn in the first week. It is now week two, which means a new batch of blogs to check out! My hive has four featured blogs today. Check them out! Welcome! 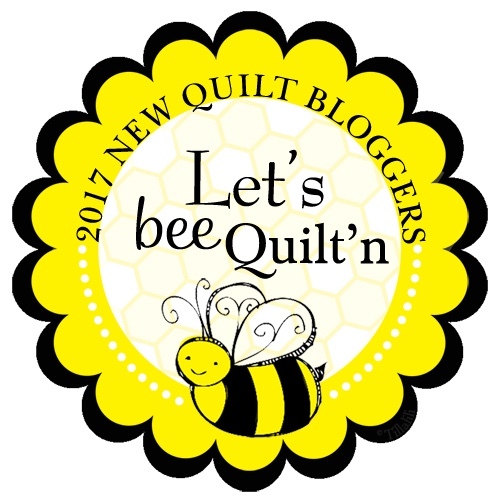 Today is the first day of the New Quilt Blogger's Blog Hop, 2017 edition. 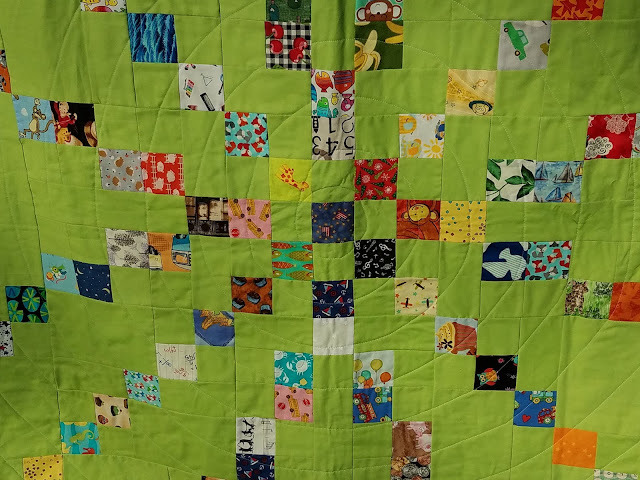 This year's activities are hosted by Yvonne of Quilting Jet Girl, Leanne of She Can Quilt, and Beth of Cooking Up Quilts. The blog hop is a way for some of us fairly new to blogging to get to know each other and get creative and technical advice. I participated last year and was thrilled that I still qualified for 2017. I'm Emily and I live in Charlotte, North Carolina. 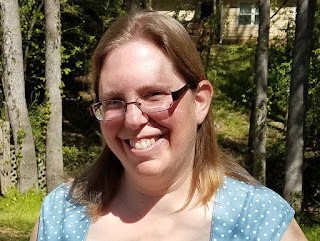 I live with Husband, who is super supportive of all things quilting, our son Munchkin, age 3, who loves trucks, pandas, and mac & cheese, and our dog Ivy. My blog name comes from my love of dogwoods, which are blooming beautifully in my part of the world right now, and family story from my childhood involving my favorite baseball player as a kid, Ron Darling. 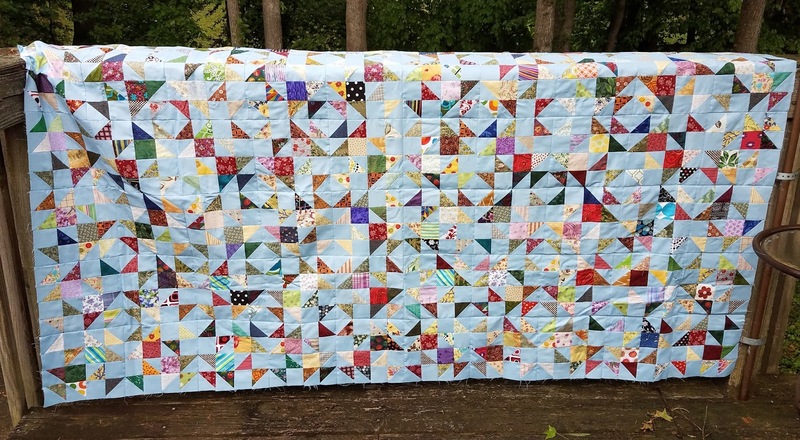 I started quilting in college and got hooked pretty much right away. 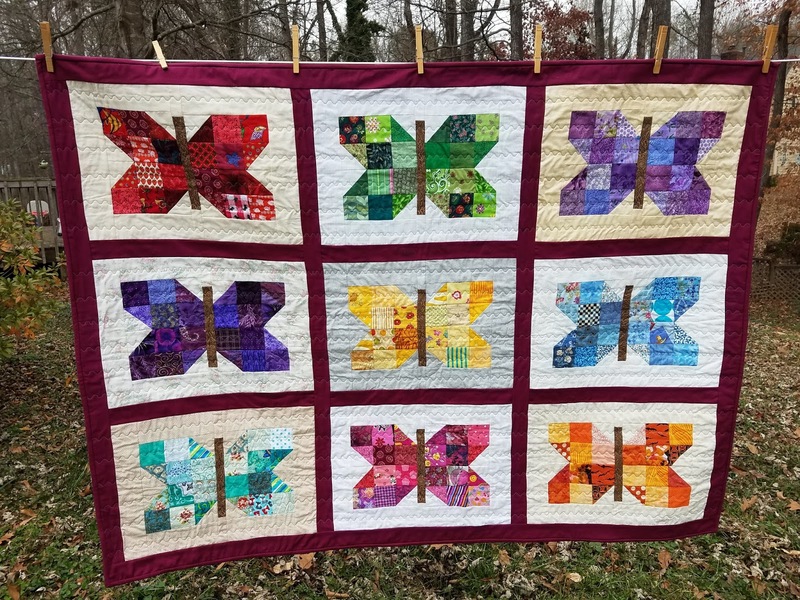 This fall will be my 20th anniversary with quilting! 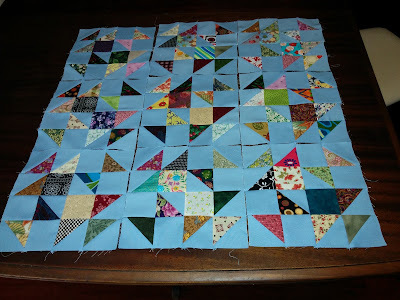 I do not consider myself a modern quilter, though there are elements of the modern aesthetic that I like. 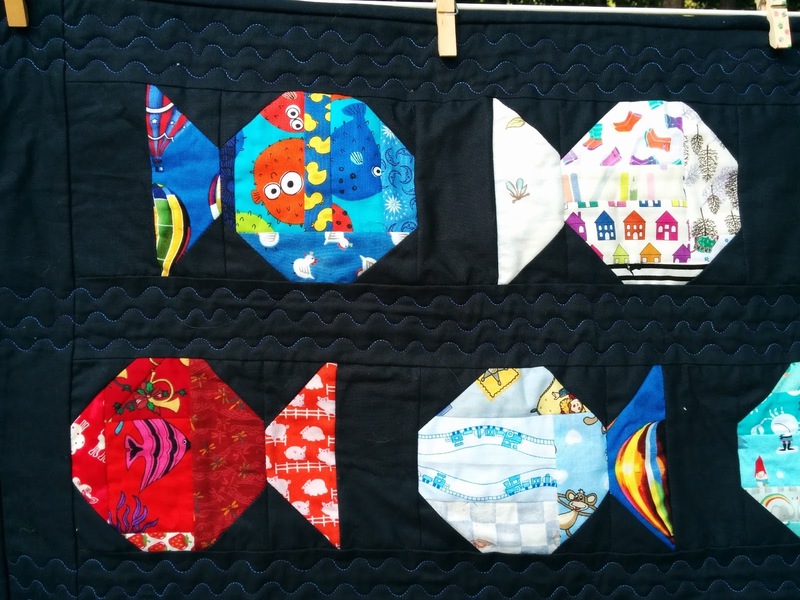 I am not even close to a perfectionist when it comes to quilting. I don't do show quilts for that reason. If everything had to be perfect, I would not enjoy myself. I do like scraps. 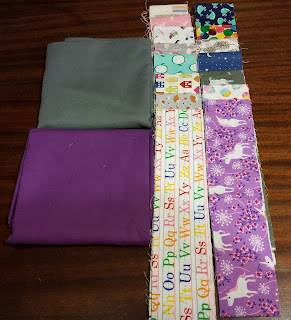 I cut my scraps into set sizes so they are easy to use in future projects. 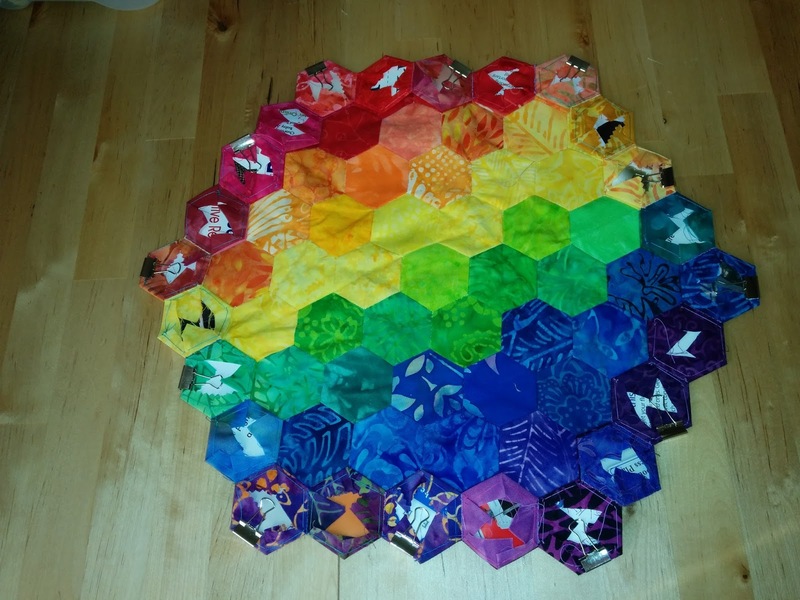 I used a lot of 2 1/2" squares in the butterfly block I chose for last year's Rainbow Scrap Challenge. 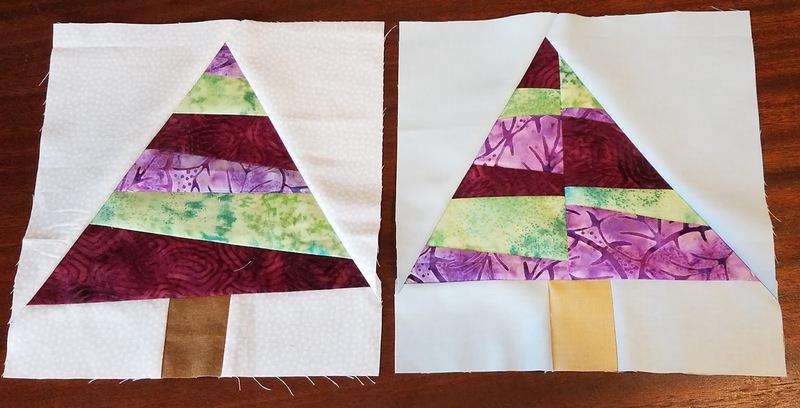 I ended up using those blocks in two different quilts. 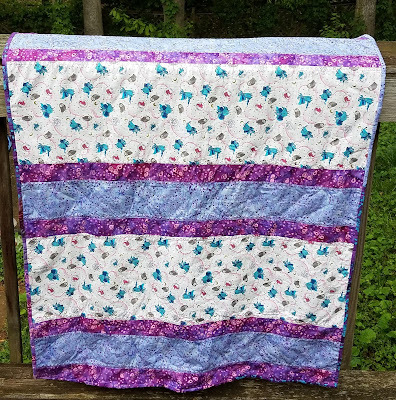 The first was Bright Butterflies for Baby June. 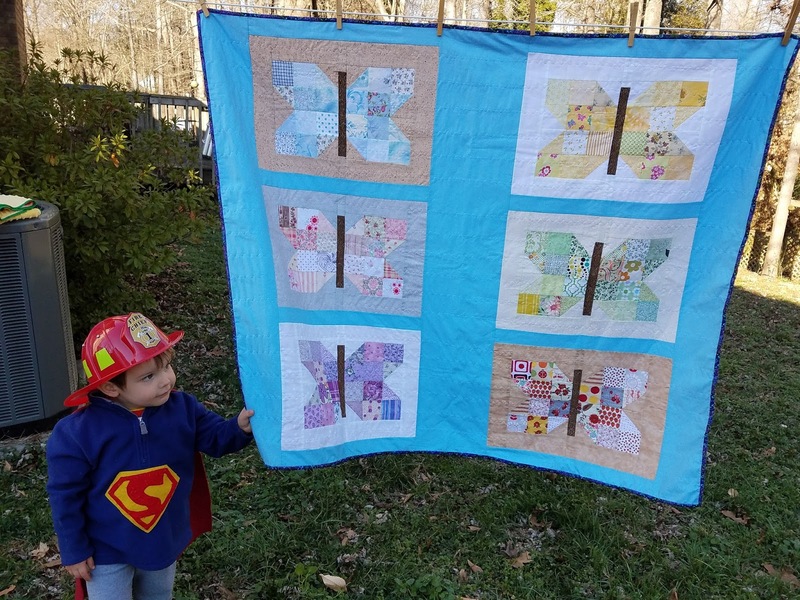 Just your neighborhood fireman, helping to make sure the quilt doesn't blow away! 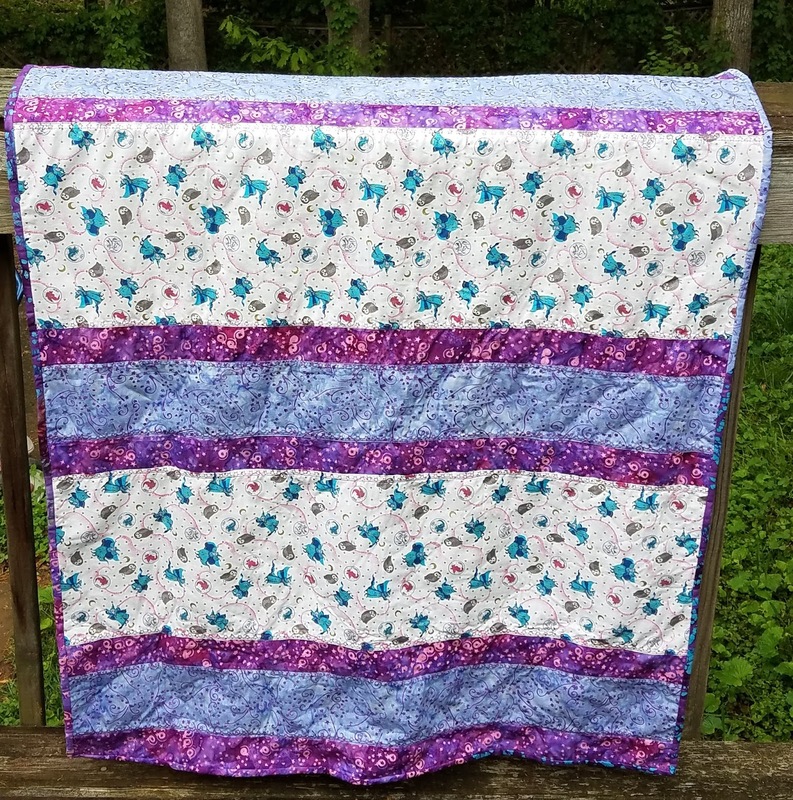 The second was Butterflies in the Sky and was donated to my local Project Linus chapter. I am an active member of the Charlotte chapter of Project Linus and have a personal goal of donating 12 quilts per year. 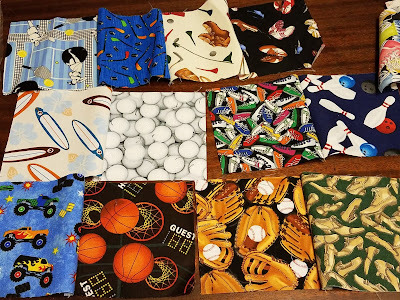 I have donated 31 quilts to that organization to date. In the fall of last year I really got into making animal pillows. 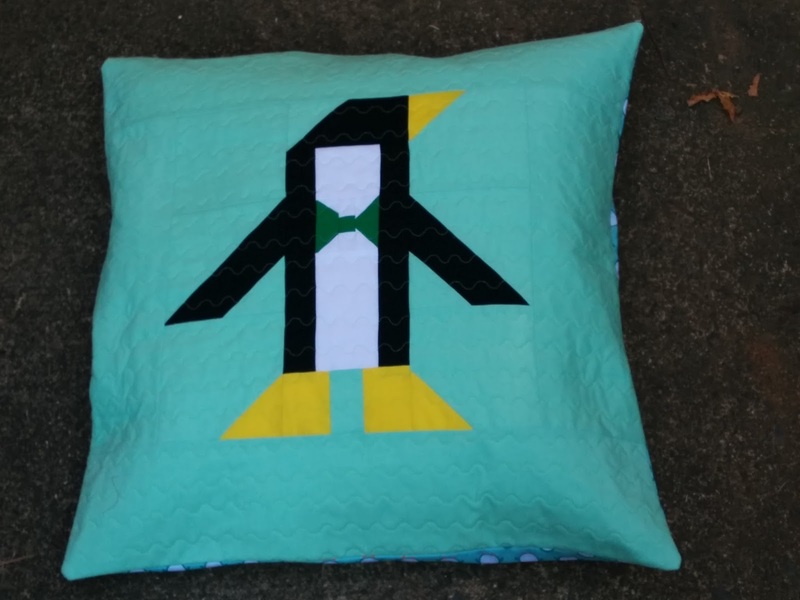 It started with a Penguin Pillow I made my son for his birthday. 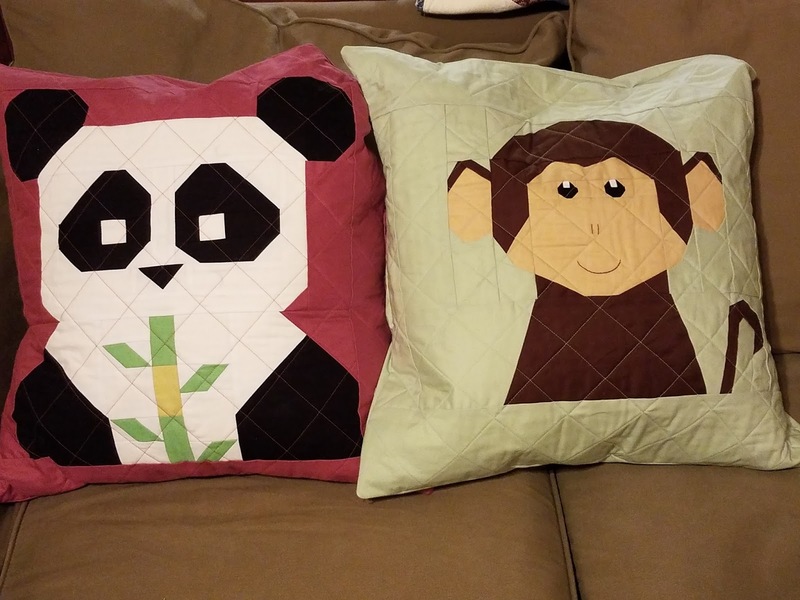 Then I decided to get rid of the horrible, bulky couch cushions so Penguin was soon joined by Panda and Monkey. Next on the horizon are Giraffe, Koala, & Elephant. 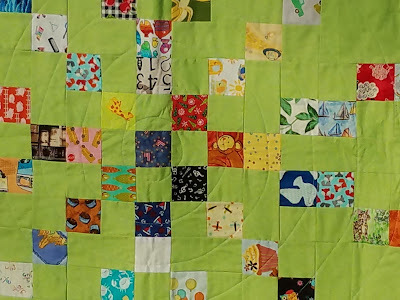 My current project is last year's Scrap Dance Tango mystery quilt, created by Carole of From My Carolina Home. (Yes, I do make quilts that aren't animals!) This quilt has two possible layouts. Since it was suggested that we ask a question for this blog hop, I am going to take advantage of the increased traffic and ask: which layout do you prefer? Help me decide! 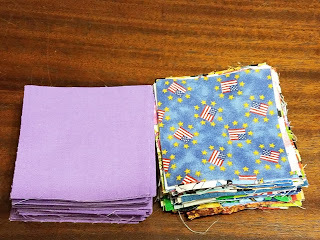 Do you enjoy scrap quilts, or would you rather start with new fabric for each project? There are 4 other bloggers from my hive, Let's Bee Quilt'n, who are also featured today. Be sure and visit them today! Thanks for stopping by! 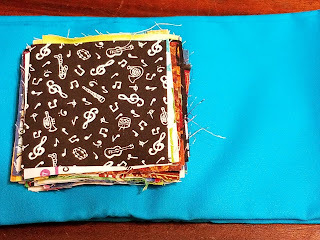 Enjoy the blog hop and visit again soon! 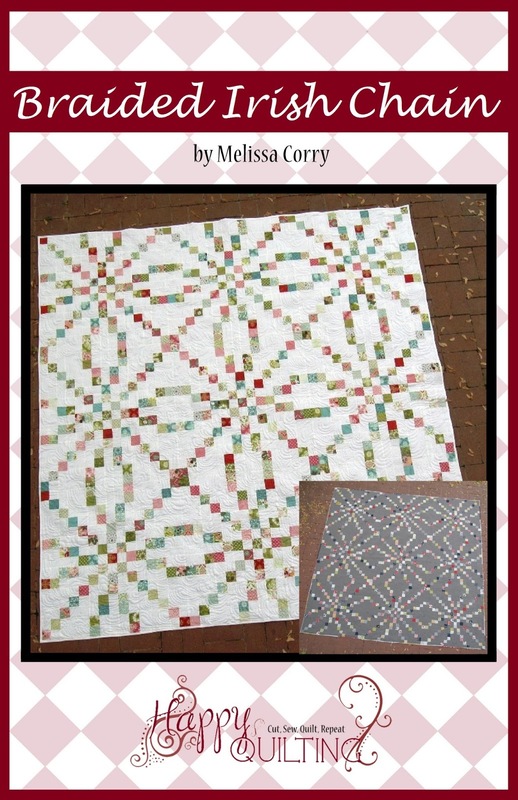 Last year, I participated in the New Quilt Blogger's Blog Hop. 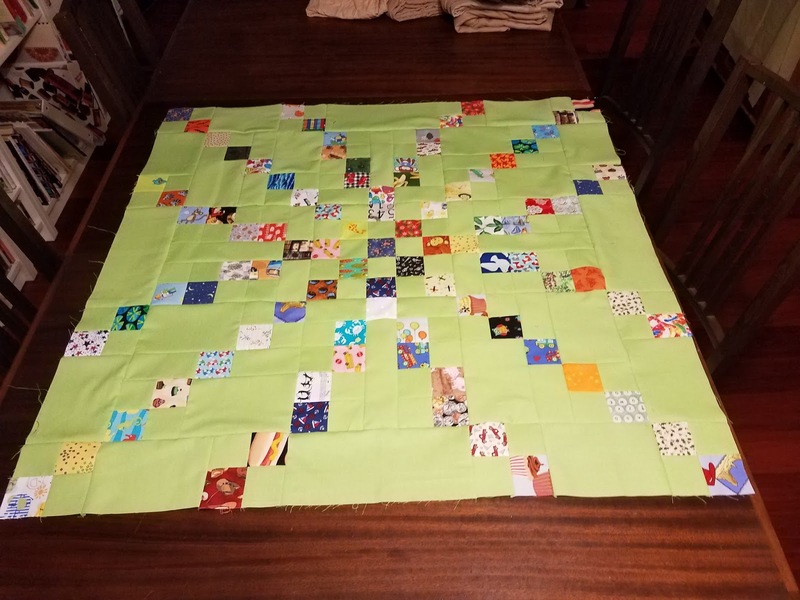 It was a really great experience, and most of my online quilty friends were people I met through my involvement in the hop. I still qualified and we were encouraged to participate again if we wished, so I am lucky enough to be involved again this year. My hive is Let's Bee Quilt'n and is lead by Leanne of She Can Quilt. There are also hives lead by Yvonne from Quilting Jetgirl and Beth from Cooking Up Quilts. Small groups of new bloggers will be posting on several Mondays through April & May. There will prizes each week of the hop from some very generous sponsors. 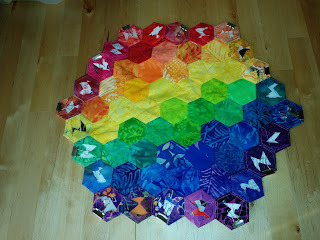 Here is a list of my hive, Let's Bee Quilt'n. You don't have to wait until their turn on the hop to check them out! 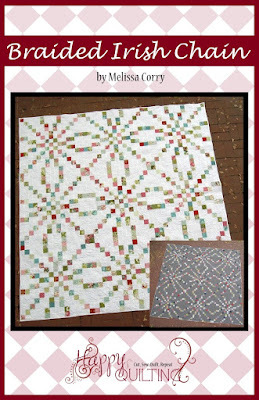 Last January, I started the Scrap Dance Tango mystery quilt created and hosted by Carole of From My Carolina Home. 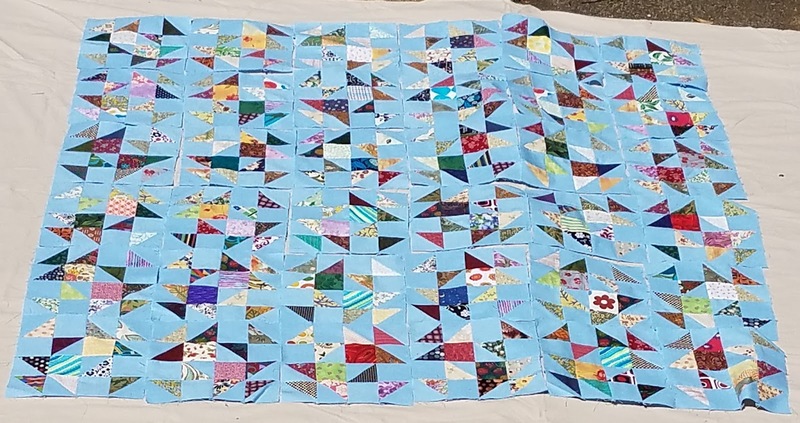 I kept up pretty well for the first half of the project, but got stymied by the 1,100 HST needed for the full-size quilt I was making. It was originally going to be a Christmas present (2016) for my dad, but when I realized this year was his 75th birthday AND he is likely to be visiting right around then, I switched the occasion and therefore the deadline. I'm still not entirely sure I can get it done in time. I need 110 blocks. I have 55 done. I have some of the sub-units for the remaining blocks done. My monthly goal for the linkup hosted by Patty of Elm Street Quilts is to complete the remaining 55 blocks I need. 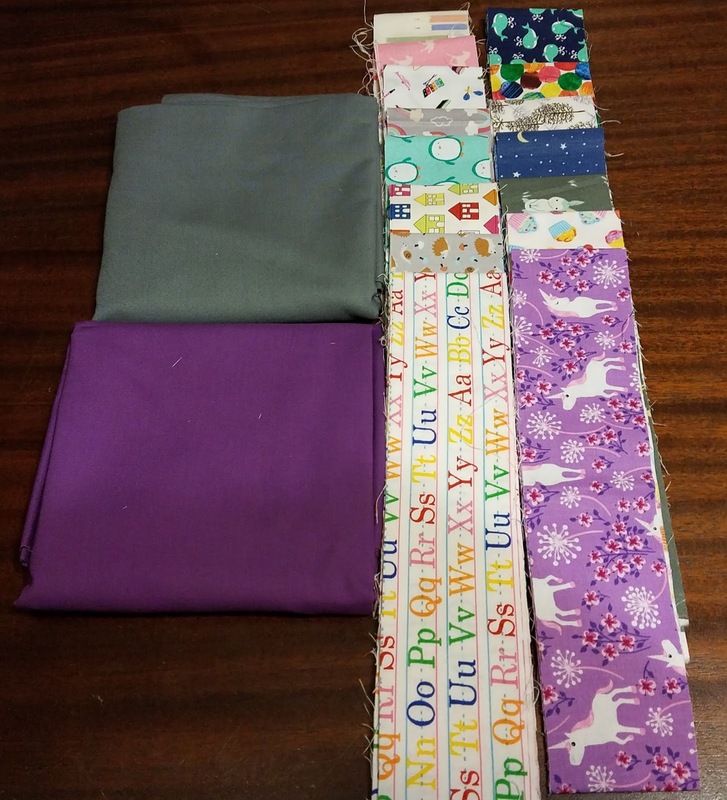 Last year, I had the lucky privilege of winning 3 patterns by Melissa of Happy Quilting as a prize from Q1 of the Finish Along. 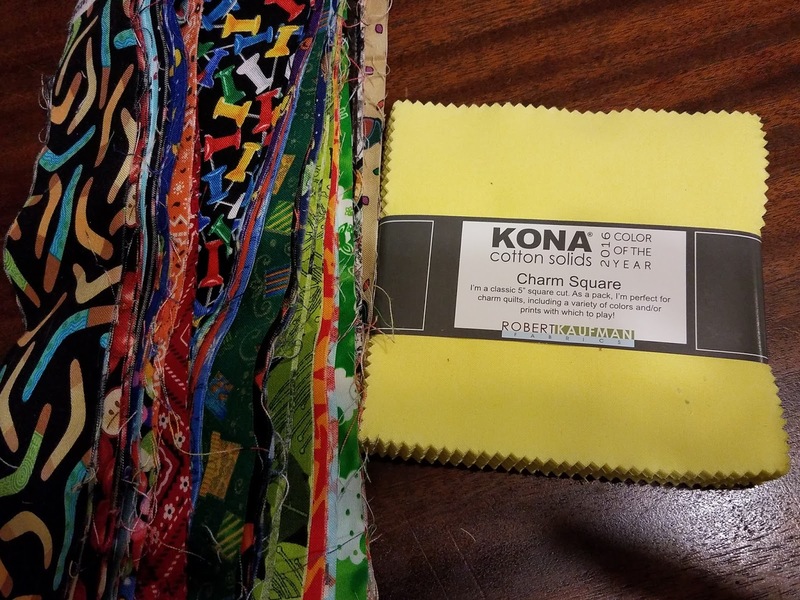 One of the patterns I chose was her Braided Irish Chain. Her pattern calls for strip piecing, but I wanted to use up scraps, specifically I Spy scraps, so I didn't strip piece but used 2 1/2" squares instead. The baby size is a single super-size blocks, made up of several different smaller components. When I finished the super sized block, I felt like it needed a little more. I decided to extend the pattern out one more row, so I did the math to figure out how big to cut the background pieces. I used Kona Cabbage as the background and I really like how bright it is. Normally, I care about the I Spy fabrics facing the same direction, but that was something I had to let go of in this quilt. I did the piecing using I Spy scraps that had been cut down to 2 1/2" squares and used this as a leader/ender project. 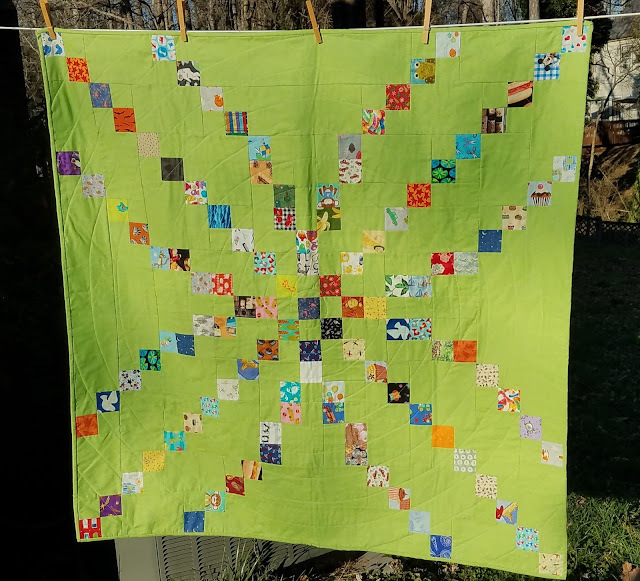 I quilted it in a big spiral. Look at all that I Spy goodness! This was a fun pattern and it's likely that I will do it again. 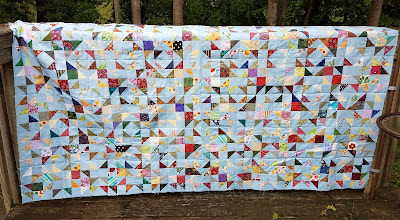 I really like it as a scrap quilt! Thanks, Melissa, for a fabulous prize! There is a house in our neighborhood that has a little goose statue on the front porch. The goose gets dressed up for various holidays--bunny ears at Easter, patriotic clothes for the 4th of July, a witch's hat for Halloween. I like this neighborhood festivity and I wanted to do something similar. So I am slowly making small seasonal quilts to hang on our front door. 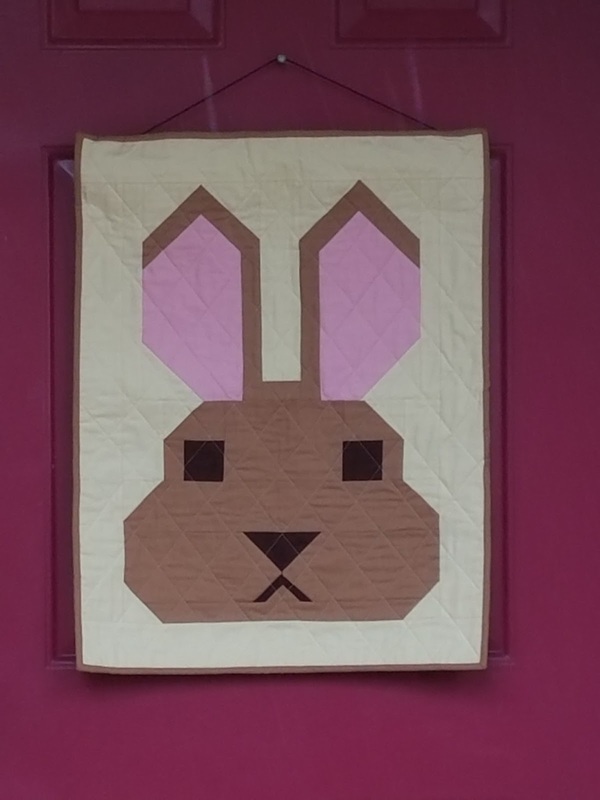 I saw this quilt by Laurel @ Quilts by Laurel and I really wanted to make my own version to hang on our front door at Easter time. She enlarged Elizabeth Hartman's Bunny block by 400%. I enlarged mine 200%. It came together fairly quickly and I love seeing it on my door! The fabrics are Kona Biscuit, Chocolate, Medium Pink, and Meringue. 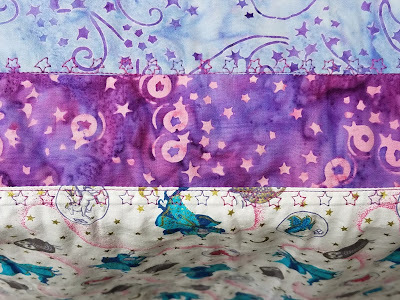 The back is a fabric I bought on a whim during my birthday fabric shopping trip with my friend Snow. 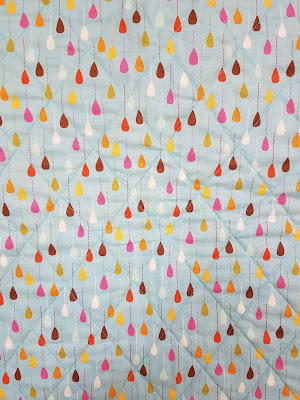 I picked it for the back because I think it looks like spring raindrops--perfect for a spring celebration! But I can't find the selvage to know what it is. 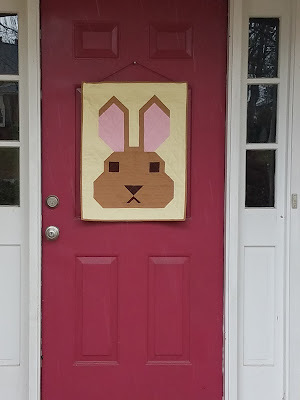 Mr. Bunny was #12 on my list of Q1 goals for the globally hosted Finish Along.